ACTON, CA — “I am now asking Los Angeles County to appoint an independent investigator since this mishandling of the Station Fire may go all the way to the White House,” asserted actor/animal welfare activist Leo Grillo. “President Obama has to authorize the federal air attack and he had not yet done so at the time I was on the radio screaming for an air attack. This is an obvious cover up.” When the fire began to spread, Grillo and his staff moved animals residing at his threatened D.E.L.T.A. Rescue sanctuary posthaste to safer ground. Others were not so lucky. Two firefighters plunged to their deaths. 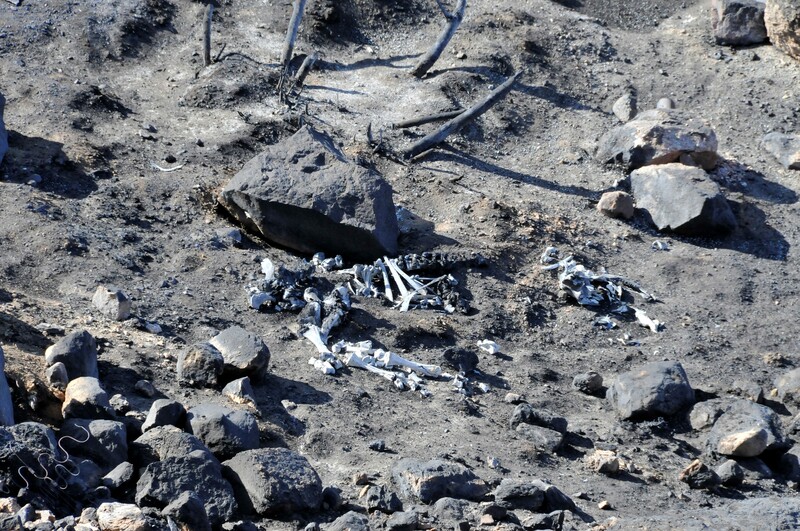 Nearly all of the indigenous wildlife in the area were incinerated. Horses were torched. What was once known as “Horse Country” is now a range of blackened twigs. Since a clear morning sky favored a preemptive air assault, the Forest Service cleared itself by placing the blame for the monstrous fire on topography. Concerned citizens still wonder why aircraft, including a tanker that can carry up to 21,000 gallons of retardant, was not deployed at the onset. Los Angeles County Supervisor Michael Antonovich, whose district covers the northern chunk of greater Los Angeles, including Antelope Valley, also blasted the Forest Service’s final analysis. Antonovich labeled the Forest Service’s opinion that an early air assault would not have made a difference “a false assertion to justify their failure,” he said in a written statement. “The bottom line on these major wildfires is that when the fires are burning, the Fire Industrial Complex is making money,” said Nemechek. Nemechek, who lives in Adelanto, says he and his family suffered the effects of smoke inhalation during the Station Fire. Grillo, who cares for more than 1,500 previously unwanted animals at D.E.L.T.A. Rescue and Horse Rescue of America, has documented a visual survey of the Station Fire before it turned treacherous and through to its baleful aftermath. He said the dreadful image he captured of the frightened horse who tried to escape the Station Fire is representative of what happens when humans allow disasters to gain control. “This beautiful, majestic animal tried to outrun the flames, apparently escaping from a burning ranch,” explained Grillo. “There are burned corrals up there [on Mount Gleason]. This horse’s body was actually cremated, which takes a full eight hours to do at a crematory. That’s how hot the fire was. “When the Fire Captain warned me that the fire would make a run at us in a few hours…I knew this would be a fight to the death,” says Leo Grillo, regarding the day two firefighters were killed. Now those living in the devastated area face an extremely dangerous health risk, stemming from the fire. ACTON, CA (09/28/09) — While detectives continue to build a murder case against the culprit who set the massive wildfire that killed two firefighters, a prominent community leader today is calling for a full-scale, federal investigation into circumstances surrounding the deaths of Los Angeles County Fire Captain Tedmund Hall and Specialist Arnaldo Quinones. The pair died August 30 after their vehicle plunged some 800 feet down a steep mountain road in the Angeles National Forest. The men helped rescue dozens of inmate firefighters held captive at their campsite by roaring flames. But according to Leo Grillo, it was a situation that never should have happened. The actor and animal welfare activist says he should know because not only was he there, he bore witness to a critical error in judgment. Leo Grillo is a world-renowned animal rescuer. He is the founder and president of D.E.L.T.A. Rescue, the largest animal sanctuary of its type in the world. “Firefighters know the truth, but they can’t tell you directly or they will lose their jobs,” says Grillo, whose position on this ill-fated day was to safeguard not only his family, but the largest animal shelter of its type in the world. They were both in harm’s way and bracing for what would eventually result in the largest wildfire in the history of Los Angeles County. For decades, D.E.L.T.A. Rescue has served as a sanctuary, or refuge, for more than 1,500 previously abandoned and abused animals. It is also home of Horse Rescue of America. So Grillo would get no sleep. Especially not this night. “I heard the radio traffic. And I talked to disgusted fire supervisors all night long,” Grillo adds. After being alerted that the Station wildfire – which began in the La Cañada area — was bearing down on his safety haven, Grillo says he rounded up all his workers and security force. Like a circle of covered wagons in the darkness of night, staff members used their private vehicles to corral the sanctuary. They then flooded the area with high beams to herd the animals to safer territory. With a well-equipped firetruck and hoses at the ready, Grillo and his firefighting team prepared for war as a small army of orange flames advanced across the mountain. Throughout the night, Grillo says he spoke with a number of visiting, out-of-area firefighters who confessed to him their reasons the fire grew into an out-of-control monster, spreading in three different directions. Their answers were the same. “Very little air support,” Grillo says the firefighters repeated. But on the night prior, a fire had broken out in the wealthy seaside canyons of Rancho Palos Verdes, near the headquarters of the Trump National Golf Club. Aggressive nighttime air assaults at the onset of this blaze helped prevent the fire from causing widespread damage. “Yet on [the La Cañada] fire to save money, the county held off on air support,” Grillo charges. Though the flames tip-toeing from La Cañada had died by morning, a foreboding threat loomed. With a flow of warm wind forecast for the day, Grillo says Los Angeles County should have ordered a preemptive air assault on what was identified as a mercurial area blanketed by hazardous dry brush and chaparral. “For hours, there was no air attack to easily extinguish the remaining threat,” recalls Grillo. “So I called the news radio to let the world know that we were sitting in the eye of a storm.” Thirty-two minutes after Grillo’s broadcast, a DC-10 air tanker flew overhead and dropped retardant. The four-hour delay was reportedly due to heavy smoke — an official statement Grillo charges is a fabrication. “There was no smoke or wind for hours as [documented] by my news photo,” disputes Grillo, who is an active member of the National Association of Press Photographers. When the fire turned treacherous, Grillo admits he feared for his life. “After the Fire Captain visited me and told me the fire would make a run at us in a few hours…I knew this would be a fight to the death,” recalls Grillo. He and ground crews stood by as the truck carrying Hall and Quinones was overtaken by a giant wall of burning mass. 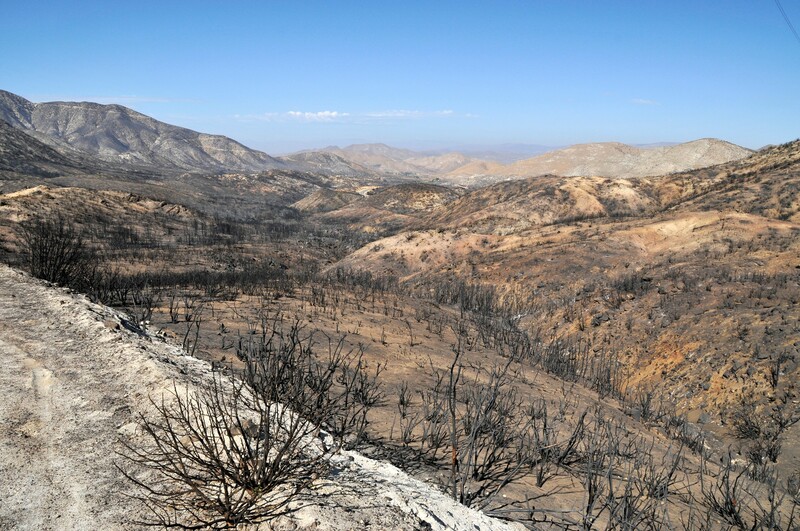 To date, the Station fire has blackened well over 240-square-miles of the Angeles National Forest. Scores of dwellings and invaluable properties were destroyed. Grillo hopes that a thorough federal investigation will result in the removal of the individual(s) responsible for withholding the air attack on this fire. “As long as these incompetents are in charge, we are not safe. Our firefighters are not safe,” he warns. Grillo adds that the front reason for calling for a federal investigation into the events that led up to the deaths of Hall and Quinones is “to [help] protect the lives of firefighters who put themselves on the line to defend against killer firestorms and who depend upon their superiors to protect them with air cover,” explains Grillo. According to latest statistics, more than 3,650 firefighters from as far away as Montana have fought the Station fire which carries an estimated cost of $78 million so far. Government data show that people were the blame for the 5,208 wildfires that occurred in Southern California in 2008. This is the only region in the United States to see a significant rise in the number of wildfires caused by humans. Governor Arnold Schwarzenegger has offered a $100,000 reward for information leading to the arrest and conviction of the arsonist who sparked the blaze. Under California law, this figure is the maximum the chief executive can offer. Authorities report that several firefighters have been exposed to cyanide gas in two separate incidents as they were mopping up hot spots near Acton, where Grillo’s 150-acre sanctuary and his two state-of-the-art veterinary hospitals are located. Now those residing in or near the broad area of devastation face a serious health risk as pathogenic spores of the extremely dangerous coccidioides fungi continue to be unearthed. Coccidioidomycosis is an infectious, airborne disease that attacks the respiratory system of humans and animals alike. Typically known as valley fever, it is characterized by a high internal body temperature and various respiratory symptoms. If untreated and chronic, this disorder can become fatal by spreading to other organs of the body. Grillo and his medical staff are currently alerting those who live or work in the greater Acton area about this acute health hazard. People and animals with compromised immune systems are particularly in danger. “We are testing it for now with at least one suspected case,” reports Dr. Gaylord Brown, D.E.L.T.A. Rescue’s chief veterinarian. It was such a joy and, indeed, a pleasure to have finally met Tony winner Linda Hopkins (“Inner City”) at a restaurant in Santa Monica, California. Ms. Hopkins received a star on the Hollywood Walk of Fame in 2005. Of all her musical performances, I asked the eighty-four-year-old stroke survivor which was her favorite. “Me and Bessie!” she said with no hesitation. Her portrayal of blues great Bessie Smith was extraordinary. “I’ve lived a long life and have no regrets,” Ms. Hopkins later told me.